While most modern church denominations pay lipservice to the idea of "equality", there is nothing equal about it. The "Honey-Do List" is a one-way street. It is one of the ways in which modern women wear the pants, run the house, and control their husbands. I don't know whether to laugh or cry. Brad Upton is one of the funniest men alive, and his comedy routines put me in stitches, so the laughing is easy. The reason everyone laughs, is because this practice has become so universal. Even among many Christians today, it is no surprise when a wife writes up a list of things for her husband to do, and then she gives it to him as an assignment. It is like a piece of homework that you'd give to a child. Thankfully, it doesn't always work this way. There are good marriages where this never happens. And there is nothing wrong with a humble wife making a respectful request to her husband, asking if he would be willing to assist with some task. Asking is OK. Demanding is not. And while most modern church groups pay lip service to the idea of "equality", there is nothing equal about it. As Brad points out in his comedy routine, most modern husbands wouldn't even think about giving a "Honey-Do List" to their wives. They know that if they did such a thing, then there would be hell to pay. Their wives would be insulted, they would complain about how much work they are already doing, and they would balk at receiving instructions from their husbands. Thus, the "Honey-Do List" is a one-way street. It is one of the ways in which modern women wear the pants, run the house, and control their husbands. Among the countless number of Protestant denominations, there are rare havens where feminist nonsense is not tolerated. A small handful of Protestants still obey Scripture passages such as Titus 2, Ephesians 5, Colossians 3, and 1 Peter 3. These folks still pay attention to God's plan for marriage. But sadly, most modern Protestants completely ignore what God says about husbands and wives. In such congregations, these Scripture passages are twisted beyond recognition. One group interprets these passages in the traditional way, while another group interprets them a different way. These two interpretations oppose each other. Yet both claim to be following Scripture. How can we settle the question? When we look throughout Church history, certain special men and women stand out, widely recognized for their faithfulness to Christ. And when we review their writings, there is remarkable agreement regarding the most important questions facing Christians. "And let a woman also be subject to her husband; because the head of the woman is the man, and the head of a man that walks in the way of justice is Christ. After the Lord Almighty, our God and the Father of the worlds, of the present and of that which is to come, and the Lord of every breath and of all powers, and this living and Holy Spirit, to whom is glory and honour for evermore, Amen. Woman, fear your husband and reverence him, and please him alone, and be ready to minister to him." "Moreover, women must with their own hands, bring from the pantry whatever we need. And it is not dishonorable for them to work at the millstone, nor to tend to food preparation in order to be pleasing to their husbands.... If a woman gets out of bed in order to bring her husband something to drink when thirsty, or to being him something to eat, such an act can only be an exercise beneficial to both her physical and moral health"
"Further, in order that the one might be subject, and the other rule (for equal honor is wont oftentimes to bring in strife), He suffered it not to be a democracy, but a monarchy, and as in an army, this order one may see in every family. In the rank of monarch, for instance, there is the husband, but in the rank of lieutenant and general, the wife, and the children too are allotted a third station in command.... And everywhere has God made governments at small distances and thick together, that all might abide in concord and much good order. Therefore, even before the race was increased to a multitude, when the first two only were in being, he bade him govern, and her obey." "The wife is a second authority; let not her then demand equal honor for she is under the head. Nor let him despise her as being in subjection, for she is the body.... He places the one in subjection, and the other in authority that there may be peace, for where there is equality of ranks there can never be peace, neither where a house is a democracy, nor where all are rulers, but the ruling power must of necessity be one." In the first quote, St. John Chrysostom says a wife must obey her husband. And in the second quote, St. John explicitly rejects the idea of equality. He says that equality leads to fighting, while male leadership provides the necessary foundation for a peaceful marriage. So ditch the "honey-do list". Remind your wife what the Scriptures say. Let her know what the saints have said. And let her know that you will not be accepting any more "assignments" from her. If she wants to make requests, that is all well and good. But she does not have the authority to control either your actions or your schedule. For 2000 years, the saints of the Orthodox Church have interpreted Scripture in the same way. None of them advocated equality, feminism, or an egalitarian marriage. Consistently for two millennia, the Church has clearly understood God's will: husbands lead, and wives obey. None of the saints ever advocated a "honey-do list". God intends husbands to lead their wives. Not the other way around. Find out why my family and I moved to Russia . . .
Are you a Protestant who disagrees with this article? Or is there a question you would like to ask? Please write in the comment section below, and I would be happy to respond. If you are disrespectful or rude, I will not give you the time of day. But if you are respectful, kind, and willing to listen, then I will gladly have a conversation with you. Did you enjoy this article? Would you like to see more like it? 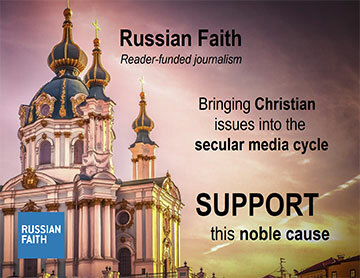 Please help us, and do what you can to keep the Russian Faith website alive. It takes a full time staff to sustain this website, and our workers need to feed their families. We have not yet met our fundraising goal, and we need your help. A recurring donation of even $5 or $10 per month would be a blessing, and will help keep us going.